Around 400 scholars, activists and artists will gather in Stockholm from 20th to 24th March to discuss the possibilities for a political ecology beyond disciplinary boundaries. The conference will be a place for intercultural exchanges on Indigenous ecologies and resistance. The ENTITLE Blog collective will be reporting on some of the main events. The European Network of Political Ecology (ENTITLE) holds its international conference UNDISCIPLINED ENVIRONMENTS from 20th to 24th March 2016 at the Students’ Union House (Kåren) of KTH Royal Institute of Technology, Stockholm. Co-organized by the Center for Social Studies of the University of Coimbra (Portugal) and KTH Environmental Humanities Laboratory, with support from KTH’s Sustainability Office, this is the first large international conference to be held in Europe in the emerging field of Political Ecology. With 90 parallel sessions (panels, roundtables and experimental sessions), and a number of artistic interventions (films, photo and visual art exhibits, poetry and drama performances), the conference is built upon a transdisciplinary methodology of peer-to-peer exchanges across different forms of knowledge, including a significant participation of Indigenous speakers. Consult here the programme. The conference is aimed at expanding the possibilities of Political Ecology as a way of understanding and reversing the current ecological crisis while promoting environmental justice and grassroots empowerment. ‘Enclosures vs. Commoning’: Prof. Nancy Peluso, University of California at Berkeley, and Prof. Ugo Mattei, International University College, Turin. The conference will conclude with the Undisciplined Activism workshop, an additional space for reflection on how to practice environmental activism in institutions, organizations, research and art, featuring as commentator Prof. Amita Baviskar, from the Institute of Economic Growth in Delhi. This workshop is co-sponsored by the ‘Transformations to Sustainability’ (T2S) Programme of the International Social Science Council (ISSC), through the support of the Swedish Secretariat for Earth System Sciences (SSEESS). The T2S Network will host a session during the conference. The conference will be a place for intercultural exchanges on Indigenous ecologies and resistance. In addition to the plenary session on Decolonial Political Ecologies, Indigenous scholars and activists will intervene in different panels, and at the roundtable “Decolonial Thoughts: What Can Be Changed”, featuring the keynote speakers Kim TallBear and Ailton Krenak, plus Sámi scholar May Britt Ohman, Kuna leader Cebaldo de León and Kaiowa Guarani leader and scholar, Tonico Benites. The latter will be speaking on behalf of the organization Aty Guasu to report on the violence perpetrated against Guarani people in the past few years (classified as “genocide” by the Inter-American Commission on Humans Rights, of the Organization of American States). The Undisciplined Activism Workshop will also feature a strong participation of scholars, artists and activists from the Sámi Indigenous community of Northern Sweden. Such large participation of Indigenous speakers reflects ongoing scientific collaborations of the Entitle network with the research project ‘Sweden and the origins of global resource colonialism’, led by Prof. Per Högselius (funded by the Swedish Research Council), and the Department of Human Geography/Human Ecology Division of Lund University. 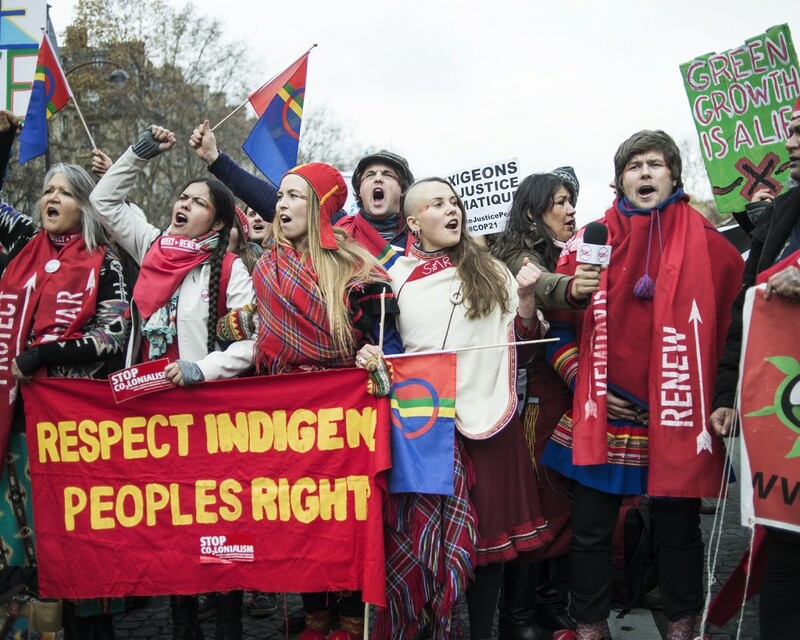 Sami youths rally at a demonstration to support the inclusion of indigenous rights in the Paris climate agreement. Source: Camilla Andersen/thegroundtruthproject.org. On Sunday 20th Sámi artist Katarina Pirak Sikku will give the opening speech of the conference, together with Prof. Sverker Sörlin from KTH Environmental Humanities Lab. On the same day, the photo exhibitions will open with four different thematic collections, and the mini film festival ‘Resistance Ecologies’ will take place in the evening. A number of short documentary films will be also screened at the parallel sessions. On Thursday the 24th, a session on art and activism, to be held at Teater Reflex in Kärrtorp, will conclude the Undisciplined Activism workshop bringing together engaged artists from different backgrounds and countries. ENTITLE is a transnational network of 13 universities, 2 NGOs and 1 private consultancy, funded within the Marie Curie International Training Network Program of the EU and coordinated by Prof. Giorgos Kallis at the Universitat Autònoma de Barcelona in Spain. The international conference “Undisciplined Environments” is the final event of the training network. Over the past 4 years, the network has developed a shared international research agenda and trained 19 researcher fellows around five key cluster themes, namely, the analysis of environmental conflicts; environmental movements; natural disasters; changes in the commons; environmental justice and democracy. During the conference, ENTITLE research fellows will present their academic outputs, which range from the study of aquaculture conflicts in Europe; waste conflicts in Campania, agrarian change in Ethiopia, social struggles over the production of edible birds’ nests in Malaysia, grassroots alternative agrifood movements in the Basque country, and the spread of vector-born diseases in Greece. This Conference has been supported by the Swedish Research Council – Formas (Dnr. 20016-000-12). The broadest possible participation of students and non-academics, especially from outside Europe, has been supported via travel grants funded by a number of individual scholars (via ‘supporter’ fees), and by the research project MOVE – Socioecological Movements in Urban Ecosystems, led by Dr. Henrik Ernstson (Formas, Dnr 211-2011-1519). ← The Earth and the people are not inputs to your capitalist system, sorry sir!